In this article we are going to write about creating pictures of 3D flat. This time we use a really professional software - so you can expects nice 3D pictures. The name of the program is KitchenDraw - you can download it from this page . (You can find the link to this program on our link page for members - and we update it there when necessary). The freely downloadable version is limited - you can use it only for a few hours - but it shouldn't be a problem. The KitchenDraw software can be used to create a 3D kitchen or a 3D bathroom. And it supports the right and left views as well - but we will describe this function later. Start the software, fill in the form (the company name should be sufficient) and then you can choose the color of your kitchen. In the list in the upper part of the window are parts of the kitchen, on the left you can select colors. Then you have to set a size of your kitchen, for example 3000 x 3000 milimeters. When you set everything mentioned above you can work with a room editor. 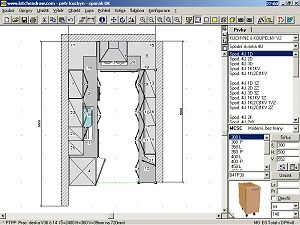 On the right side - in it's upper part - you should select a database of components (kitchen, bathroom...), below set the type of cupboard and below are cupboards. You can set it's features as well - the height, width etc. Now you can drag and drop the cupboard to a selected place in your kitchen. Then click to it with the left button and with the right button of your mouse - and you can set it's features again (for example it could be positioned higher to be placed on another cupboard). You can't place an object to the same place where is another object - but you can place it above it or under it. The editor offers a few display modes. If you want to place and move cupboards then the best mode is Ground plan (you can set it with the button beside the one with a picture of money), final picture can be created in the Perspective mode (the button with a camera). In the menu (View) you can set if you want to see the picture with your left eye or with the right one. Set the left one - and save the picture (File/Export or Print Screen key + graphical editor) and then repeat it for the right view. 3D picture can be created in your 3DJournal software as you are used to.